Superficial radiation therapy was first used to treat non-melanoma skin cancers, such as basal cell and squamous cell carcinomas, back in the 1970s. For the last few decades, the treatment method fell out of use due to a decline in available machinery. Now, the treatment is making a resurgence as our machine becomes more widespread. Why should you get the SRT-100 in your office? This method of treatment offers many benefits unavailable with other treatment options like Mohs Surgery. Because no anesthesia is required for superficial radiation treatment, this makes it a great option for those who cannot go under for surgery. This includes older patients, unhealthy people with compromised immune systems, those whose bodies do not heal well, and patients on blood thinners. Superficial radiation therapy is a completely non-invasive treatment for non-melanoma skin cancers. There are many patients who would prefer to avoid the knife completely – for cosmetic and psychological reasons. After radiation treatment, the side effects tend to be mild. Patients can expect some light redness and irritation, all of which are easily covered with makeup or hidden by clothing. No surgery means no scarring. When undergoing Mohs surgery, there’s a risk that the scars can disfigure your skin. This becomes an issue for most patients when the affected area is the face, neck, eyes, ears, nose, or lips. The most complicated aspect of the treatment process is setting up the machine. Most of the time, patients can be in and out of the office in 45 minutes to an hour. After a session, they can go right back to their typical daily lifestyle. 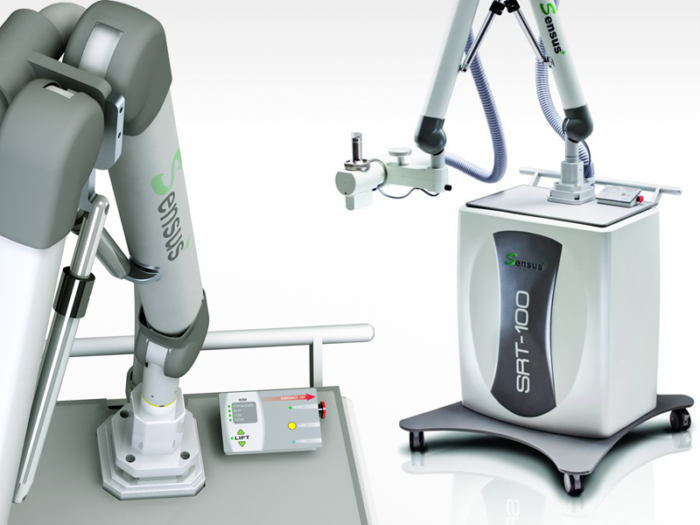 Are you interested in learning more about the SRT-100 for your practice? Contact Sensus Healthcare today for more information.